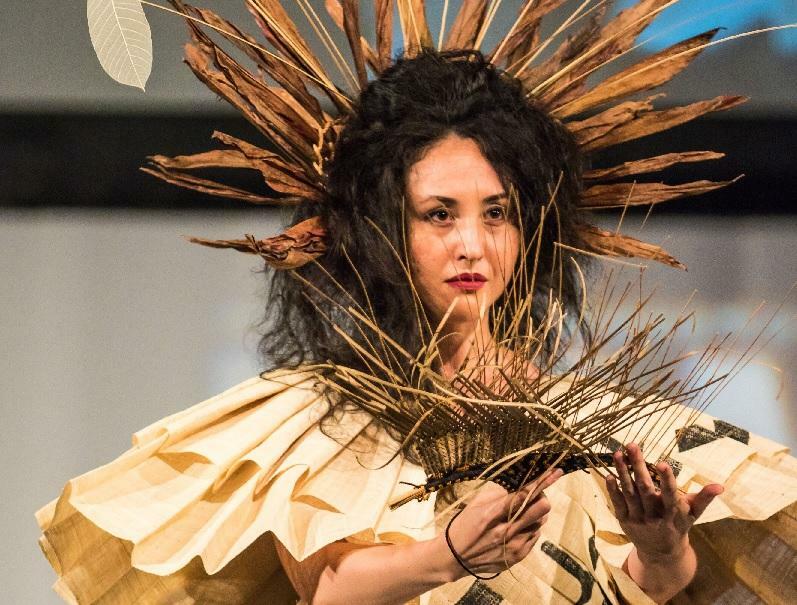 From the MAMo Wearable Art Show 2016, this model sports a headdress and clothing by Marques Marzan, textile artist, and cultural advisor for the Bishop Museum. Credit Kyle Wright, courtesy of PAʻI Foundation. 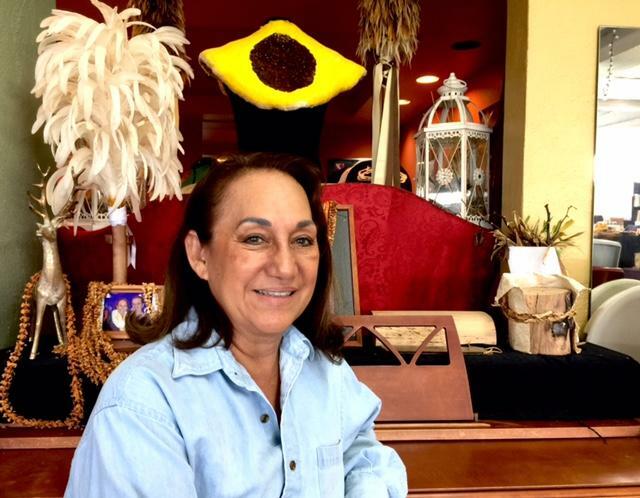 Conversation with Kumu Vicky Holt Takamine, Executive Director of the Pa‘i Foundation and kumu hula of Pua Ali‘i ‘Ilima about the MAMo Wearable Art Show, and a chat with Kanoelani Davis of Pomahina Designs. 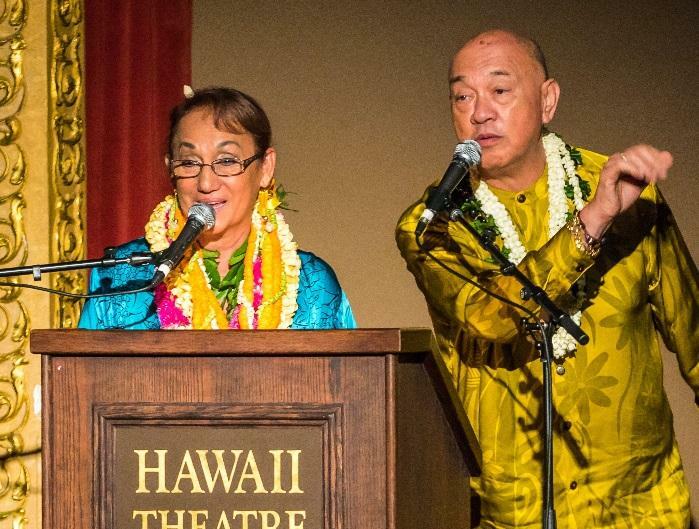 Vicky Holt Takamine, Executive Director of the Pa‘i Foundation, talks about the genesis of Maoli Arts Month/Movement and her plans for Pa'i Foundation's Kaka'ako artists' spaces. They hope to break ground later this summer. Vicky Holt Takamine is Executive Director of the Pa'i Foundation and kumu hula of Pua Ali'i 'Ilima. The MAMo Wearable Art Show happens Wednesday, May 17th 2017 at the Hawai‘i Theatre, 7pm. Find Hawaiian made lauhala, t-shirts, jewelry, and more at the MAMo Arts Market this Saturday evening (5/13/17) at Helumoa/Royal Hawaiian Center. Vicky Holt Takamine is Executive Director of the Pa‘i Foundation and kumu hula of Pua Ali‘i ‘Ilima. 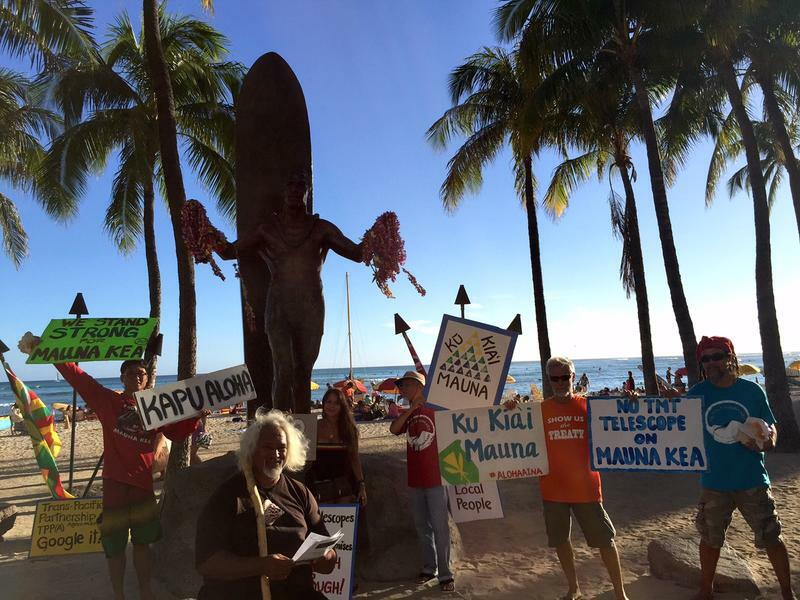 Takamine says hula helps integrate humans and the natural world. Takamine: We talk about love, we talk about our ocean, our wind, our rain, all of our natural resources, our flowers, our fauna. I think that’s why, for me, hula is uplifting, and enriching. You come to hula class and you walk out feeling a better person. MAMo at Honolulu Night Market. Takamine has been the driving force behind MAMo--Maoli Arts Month---now officially the Maoli Arts Movement. Takamine: The whole purpose for MAMo for me, was to showcase Native Hawaiian art and artists and cultural practices, and educate our public about what Hawaiian art is. Takamine: The very first was in 2006 at the Bishop Museum. Then next year, I was like, you know what we’re missing? We’re missing art that we wear. Wearable art. So I called it a wearable art show because it’s not fashion. It’s the things hula people wear. It’s our kīhei, it’s our featherwork, it’s our lei hulu, it’s the lauhala. All of that gets applied and put onto our bodies, so its kākau, kinolau, all the tattoos, our tattoo artists. It gets put on fabric, the things that we wear. So I looked at that as an industry up and coming. Wearable art by Marques Marzan in the MAMo Wearable Art Show 2016. 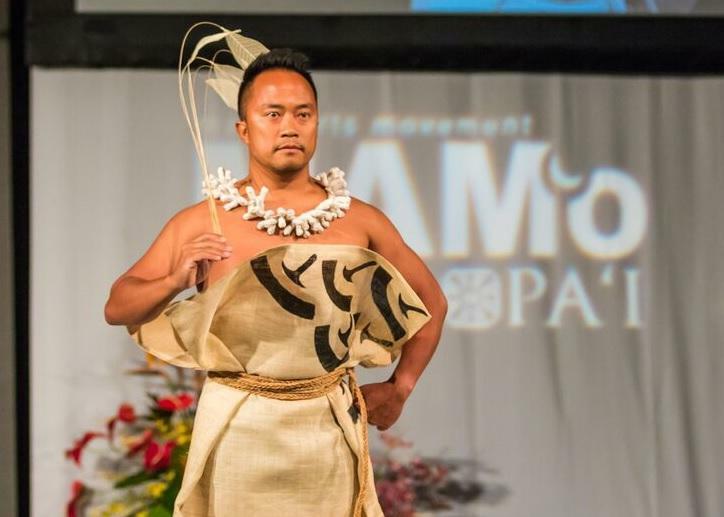 Interestingly enough, a lot of that has come out of the hula community, from the younger generation like Manaola, Baba Yap, and our fashion show this year will feature another hula related designer, Chaz Kamau’u. The son of Natalie Ai and ‘Iolani Kamau'u. Hula Tee’s is a brand new clothing line that just started this year. He first showed at Merrie Monarch this year and we’ve invited him to be part of our Wearable Art Show. Showmanship is big—this is the MAMo Wearable Art Show, after all, and it IS hosted by Vicky Holt Takamine and Robert Cazimero. You’ll see a Hawai‘ only vocabulary of materials and shapes on this catwalk---and you see smart local chic. And you'll see guys. Think Merrie Monarch meets Project Runway. Ari South, by the way, makes her MAMo debut this year. Vicky Holt Takamine and Robert Cazimero hosted the MAMo Wearable Art Show 2016. Lotta new faces in this Wearable art Show! Kanoelani Davis from Kamiloloa Moloka‘i is the owner and creator of PoMahina Designs, one of the new lines on the Hawai‘i Theatre runway. Davis’ inspiration was the goddess Hina, intimately connected with her home island. Looking for extra income, Davis began putting Moloka‘i theme designs on caps that became popular first in Hilo. Davis: It’s mainly me still that does everything. When I first started it, everything was made here on Moloka‘i and everything was made by me at home. Then I started to expand and get bigger, I started to recruit help and contracted other people from Moloka‘i to do things to help me. Now we’re at a place where it’s too much, so now I’m going outwards, whether it be to O‘ahu or to the continent. Davis: So I’m very fortunate. But I stopped the hats, they became very popular, people are making them left and right. In order to give others that chance to have that too and not repeat, I tried to find something else I could work on. So from hats we went to clothing, and then I went into shoes and I started doing canvas shoes. Davis: We still do very well with canvas shoes, not too many people do that. The canvas shoes used to be made in the US, but now we have to send them outward. Yes, to China. I do my best to keep what I can in the US, so we just started running shoes and that is in the U.S.
Did you have to travel to china, or do everything online from Moloka‘i? Feather filled bust decoration by Kawika Lum on this gown, set for the MAMo Wearable Art Show 2017. Davis: Everything was through friends networking, and just meeting great people. They helped me finding different avenues and kind of really empowered me to don’t be afraid and reach out and give me their contacts and that’s how that all began. The upcoming MAMo Wearable Arts Show will be her first time as a headliner on the runway. She has models converging from different islands, some are customers who just volunteered to be part of her show. Davis, a single mother of four, still teaches art part time. 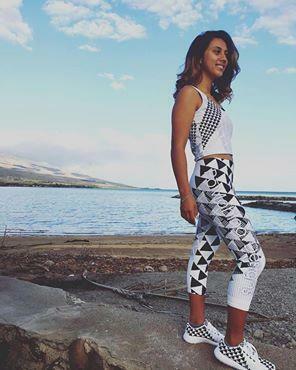 Yoga wear by Kanoelani Davis' Moloka'i based company, PoMahiina Designs. 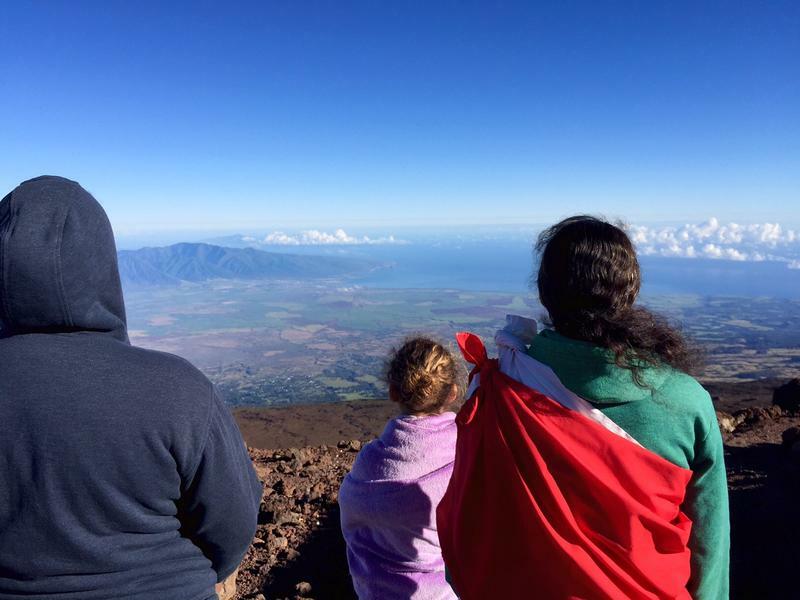 they feel like, Oh, Moloka‘i will never survive, but I think we’re pretty resilient and we persevere through just about anything and we use all our creativity to make things happen and work for us. We’re very very lucky in that way. Davis: And a lot of the time, our purpose is our families. Being a single mom, I had no choice. It had to work. This had to work, it has to, because that was our way of surviving. As far as my kids, if they can at least see the hard work and if they see and experience problem solving and critical thinking, and other things, that’s the best thing I can give them at this point. You’ll be able to purchase Davis’ leggings and sporty wear under the Pomahina label, as well as wearable art by all the show designers in a trunk show at Marks Garage after the runway show. There will be a silent auction of special designer pieces in the mezzanine at the Hawai‘i Theatre; stop by before the show or during intermission. Bids there and direct contributions to Pa;i Foundation help support MAMo 2018. Hawai‘i’s hula community was the first to support local wearables and artists and this scene has come a long way! Trunk Show to follow at the ARTS @ Marks Garage (Pauahi Street & NuʻuanuAvenue). Designers: Sonny Ching, Kanoelani Davis, Momi Greene, Kawika Lum-Nelmida, Keoua Nelsen, Kehaulani Nielson, and Nita Pilago. Native Hawaiian arts market at SALT at Our Kakaʻako in Honolulu. Also featuring entertainment and a mini fashion show! Honoring PAʻI Foundation 2017 MAMo Awardees: Moana Eisley, Umi Kai, and Brook Parker. Artists: Kanoelani Davis, Momi Greene, Anna Kahalkulu, Kawika Lum-Nelmida, Keoua Nelsen, Koa Johnson. Maui Arts & Cultural Center and the ;PA’I Foundation presen MAMo at the MACC for the fourth consecutive year.